20km due north of Wellington, west of the Hutt Valley, is the harbour city of Porirua, sitting at the base of the Kapiti Coast by the Cook Strait. Meaning "two tides" in Maori, the city stretches in an almost complete circle around the waters of the harbour, with the Mana Esplanade road bridge traversing the narrow waters of Ivey Bay. Porirua is where New Zealand's first McDonald's was opened, in 1978, and is also home to the Royal New Zealand Police College, where all the country's new recruits must undergo 19 weeks training before being let loose on the streets. Water activities are obviously popular in Porirua, with the harbour playing centre stage to windsurfing, yachting, powerboating and rowing. The Aotea Lagoon, in the calmer waters of the western 'loop' of the harbour, is a popular picnic and boating spot, while the marina at Mana houses some of the larger, more expensive boats and is great for people watching. Other sports take place at the Te Rauparaha Arena, which has two indoor stadiums, a skate park, health clinic, fitness centre, cafe and aquatic centre. 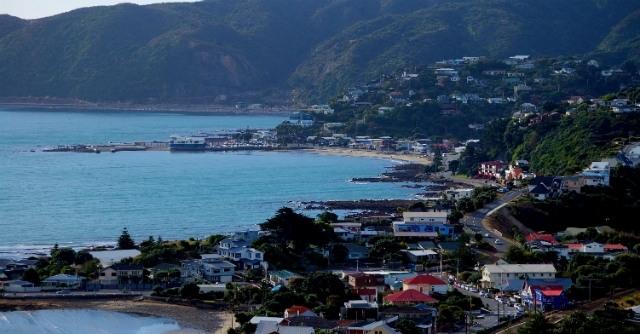 Easily accessed from SH-1 between Wellington and the Kapiti Coast, as well as being on the Kapiti and Overlander railway lines, Porirua is a popular commuter town, but prices are steep because of the coastal location. Residential suburbs are split into two sections, those with coastal views and those inland. On the north shore, Camborne, Mana and Pimmerton are the main suburbs, with shopping centred around the latter. On the south shore, there are numerous green spaces and well-proportioned houses with different areas of distinct characters. The beautiful Papakowhai suburb is famous for the trees it was named after, by Aotea Lagoon, whilst to the far east of the city, the village of Pauatahanui is home to a wildlife reserve which preserves the lower North Island's only remaining estuarine wetland. Whitby, just south of Pauatahanui, has streets which are all named after James Cook, and the pretty seaside settlement of Pukerua Bay, is worth a visit, if only to see where Lord Of The Rings director, Peter Jackson, spent his childhood. For outdoor pursuits, there's an adventure park at Adrenalin Forest, with high wires, obstacle courses and tree climbing, and to the west, at Titahi Bay, there's the Whitireia Park Reserve and a golf course (and is where pro golfer Michael Campbell grew up). Shopping takes place in the CBD, in the streets between Lyttleton Street and Titahi Bay Road, and include the MegaCentre, North City Shopping Centre and the 'Canopy Connection' of traditional outdoor, high street shops, characterised by the white canopies that provide shade during summer and protection from rain in winter.